While excavating a historical well on a property so the owners can get a building consent to make an extension on their cottage, one of archaeologist Sage Westfield’s PhD students discovers a grouping of bones. Further examination reveals the skeletons of an adult female and a newborn child. The well becomes a crime scene, albeit a 400-year-old one. The Bassetts, owners of Bramble Cottage, are disturbed, of course. They wanted to add on to their cottage. Now part of their property is surrounded by yellow crime tape. They have more pressing problems, however. James Bassett is dying. His wife insists there’s a malignant presence in the cottage. This time, she may be wrong. Sage is more touched than she shows to the death of the infant, for she is also an expectant mother, though a single one. After discovering he’s married, she’s broken with her child’s father, a man unaccustomed to being rejected. Since Marcus Thompson works in Banstock, and sees Sage often in passing, he begins stalking her. Besides finishing the excavation for the police and preparing for her baby’s birth, she has that to contend with. Then, Sage meets Nick Haydon, the village’s new vicar. Originally asking about proper burial for the bones, Nick’s soon showing more interest in Sage than the remains, however. With Nick’s assistance, she learns through church records and village history the probable identity of the victim. Isabeau Duchamp was a Tudor seamstress employed by Lord Anthonie Bansntock, a local landowner. She was French and therefore under suspicion by the locals. An affair with the Banstock heiress’ betrothed results in a child. Isabeau is accused of being a witch and enchanting the fiancé, Solomon Seabourne, who later becomes a noted alchemist. Lord Anthonie never believes in her guilt, however. There’s a woman buried in an unhallowed grave far removed from the church cemetery. Is it Isabeau? But if the mother is buried there, who is the woman in the well with Isabeau’s child? Symbols carved into the well’s wall suggest an invocation to a supernatural entity, a mutilated doll oddly resembling Sage is found in her car. Does it have something to do with Solomon Seabourne’s alchemical studies? A hidden camera is discovered in Bramble Cottage. Someone is spying on dying James Bassett. The more she learns, the more Sage becomes convinced the ancient deaths weren’t an accident. When the battered body of one of her students is discovered in the well, she faces more unsettling facts regarding her own safety in the present. Has obsessive Marcus attempted murder and killed the wrong woman? Is the history of Isabeau’s death about to repeat itself with Sage and her child as the new victims? This is a swift-moving story with some very interesting characters against the very creative background of magic, alchemy, and witchcraft. Sage is a self-possessed young woman facing the birth of her own child in less than ideal circumstances, with a stalking former lover, his vengeful wife with no reason to hate Sage who’s taken herself out of the picture, and the shadowy stalker obviously wanting her dead. Sage’s new love-interest, Vicar Nick Haydon is nothing like the usual cliché of a pastor. Non-condemning of Sage because of her unmarried, pregnant state, he doesn’t let his religious position stand in the way of a more than passing interest in her, showing his romantic attraction and risking his own life when she realizes she’s in danger. Marcus Thompson is cast as a self-indulgent man who always gets what he wants and probably wouldn’t be above murder if that’s the only way to have it. The including of the Banstock estate steward’s journals reveals the original crime as well as that man’s own secrets. Comparing them with contemporary events brings parallels of the historical murder into sharp contrast with that in the present. Sage’s reasoning out of the cause of Isabeau’s death, and its perpetrator is an intricate and perceptive one. The discovery of the present-day killer is no less exciting and a bit of a shock since it’s the last person one would suspect. 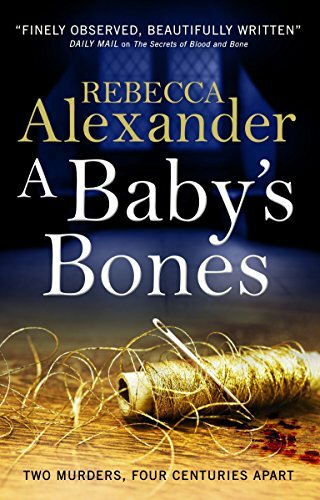 A Baby’s Bones is an exciting foray into an ancient crime, with a likeable, intelligent heroine who breaks the expected norms within her own life.